“There Was Never Any Intent to Raise Rates” – It Was All About Targeting Gold! The Government’s “non-farm payroll” report – aka “the employment situation” – reported an alleged 160k jobs added to the economy in April. I am loathe to even discuss this fairy-tale report out of disdain for ascribing any legitimacy to a complete work of fiction. It is mind-blowing to me that economic “experts” like Mark Zandi jump on the financial market propaganda networks and attempt to conduct a serious discussion about the numbers (I remember when Zandi was a mediocre analyst for Moody’s – he was hack then and he’s a bigger hack now). Having swept aside those reservations I want to point out that, of the 160k jobs allegedly added to the economy in April, the Government whipped up 233k jobs from its “birth/death model” statistical plug metric (click image to enlarge). Without this fictitious numerical addition to the overall report, the economy in April lost jobs (the 233k number is pre-seasonal adjustments so it’s not mathematically correct to subtract 233k from the 160k, but it is correct to infer that the pre-birth/death number was negative). The birth/death model is the Government’s estimate of the number of new businesses that were created in April net of the number of businesses that closed. There’s not really words available that can describe the absurdity of the B/D model. I’ll let the reader scan through the numbers in the graphic above to decide whether or not – in the context of every other economic report released in April – if the economy produced enough new businesses to affect the amount of hiring reflected in the Government’s report. Ironically, Goldman Sachs has raised its forecast for the U.S. non farm payrolls (NFP) on Thursday, expecting the employment report to crush expectations with a number closer to 250,000. This is despite the fact that Goldman itself has slashed its payroll this year, cutting its fixed income division employment by 10%. It’s just amazing how fraudulent the entire U.S. system has become. It would be interesting to see the motivation behind Goldman’s highly misleading research reports, specifically the bank’s jobs forecast and its interminable forecast of sub-$1000 gold. Please recall that when gasoline prices were falling the story-line pitched by Wall Street was that it would create a big bounce in consumer spending. This big bounce never materialized per retail and restaurant sales reports over the last several months. But also notice that Wall Street and the financial media market promoters are dead silent on the effect that higher gasoline prices will have on the consumer. Anyone who follows the housing market knows that for the last year that new housing starts – notwithstanding the conspicuous manipulation embedded in the Government’s reporting methodologies – have been largely driven by multi-family dwellings (big apartment buildings). But the graph on the right shows that multi-family dwelling “starts” have been declining as well. In other words, the Government would have us believe that 37k jobs in construction were created in March despite the fact that construction spending is in a downturn. It’s laughable. Keep in mind that the Census Bureau collects the data for the employment report, construction spending and housing starts. It’s no surprise that even its own data is inconsistent. The same idea applies to all of the areas in which the Government is reporting there to be new jobs created except maybe healthcare. Healthcare has indeed been the one area of growth in the economy because Obamacare has triggered a massive increase in Government-backed healthcare spending which is being financed by additional Treasury issuance and a massive transfer of wealth from the middle class to the disadvantaged class and to all of the private companies associated with healthcare (big pharma, hospitals incorporated, insurance, etc). I turned up the volume – regrettably – on Fox Business this morning after the jobs report because I wanted to get some amusement from listening to the so-called “experts” explain why the economy was supposedly producing an unbelievable number of jobs. Interestingly, Maria “Money Honey” Bartiromo was unable to disguise the look of total disbelief on her face in response to the employment report. Some dope by the name of Steve Moore tried to justify the data by claiming that the big reduction in the cost of gasoline has created higher disposable income for consumers to spend in discretionary areas – he specifically cited restaurants – which has offset the jobs loss in energy and mining. Steve, where are you getting your views? The facts, unfortunately for you, do not support your thesis. For instance, retailers have been laying off thousands and closing down stores en masse since the end of December. 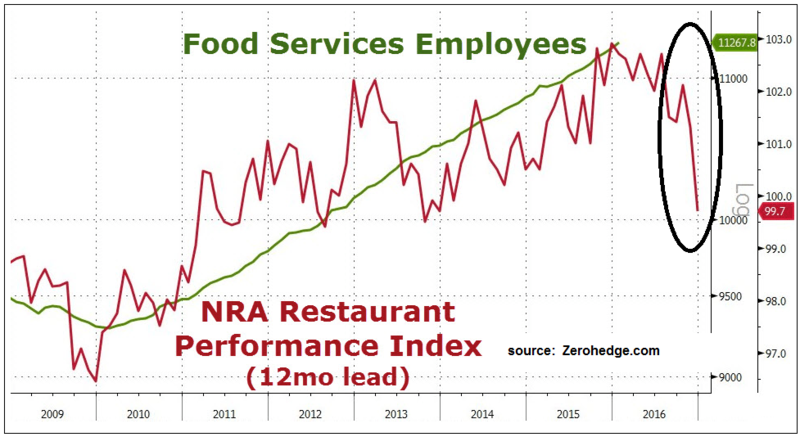 As you can see from the graph to the left, the restaurant industry, like the retail industry, is shedding jobs hand over fist. Steve, I would suggest that next time you spew your garbage on a public forum, you better do some fact-checking in case there’s some viewers who know the facts. Then there’s financial services, which the Government claims added 15k jobs. Tell that to the several thousand who were fired last month from big Wall Street firms. Not sure where the Census Bureau found the 15k new jobs. I suspect that the data collectors turned over some rocks and made up the numbers. And then there’s the biggest problem. The Government produces several different versions of the employment situation in one report. There’s the Household Survey and the Establishment Survey. Then there’s the U-3 report and the U-6 report, each of which shows substantially different unemployment rates. U-3 shows 5% unemployment and U-6 shows 9.8% unemployment. Which one is it? John Williams of Shadowstats.com has tracked the employment reports for many years. His work shows that the true unemployment rate is well north of 20%. This is validated in the context of the massive number of people who are no longer considered to be part of the labor force. Most of those close 100 million not in the labor force are the ones who “fell off” unemployment insurance and stopped looking for work. Many are now on welfare of some type. Since 2001, the number of people who “qualify” for Social Security Disability Insurance has more than doubled to nearly 9 million. They are considered not part of the labor force and there’s law firms who have built their practice around getting people qualified. Then there’s the student loan factor. If you can’t find a job, apply to an online university and get a student loan. Since Obama took office the amount of student loans outstanding nearly doubled from $700 billion to $1.3 trillion. Once you get approve for that loan, the Government does not have to count you as being unemployed. The market response to the employment report is just as absurd as the report itself. 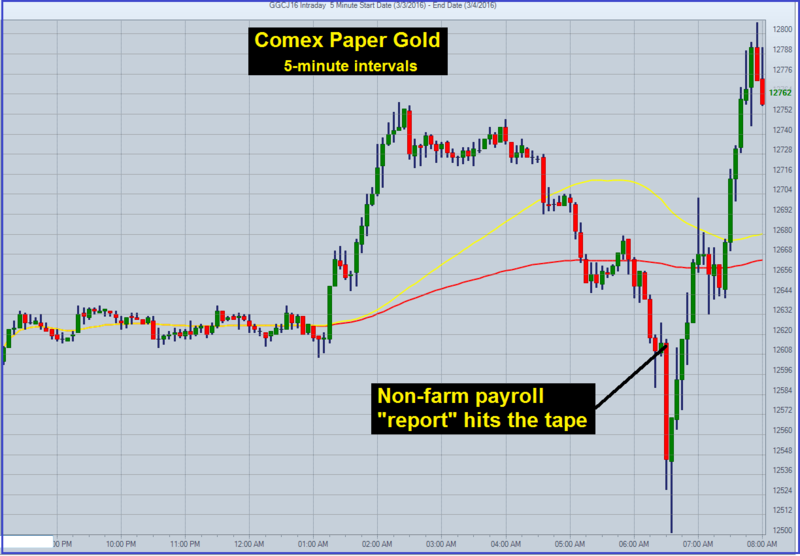 The stock and the precious metals were slammed initially. If stocks and metals were hit because the employment report implies that the Fed will raise rates this year, then why has the S&P 500 and Dow rallied to go green on the day and gold and silver are still down $16 and 53 cents respectively? Corporate revenues are showing no growth and GAAP net income has declined four quarters in a row. I’ve got news for the Government, when companies are not producing revenue growth and their net income declines, they get rid of workers, not hire them. Gold has been hit for as much as $23 today and silver for 66 cents (over 3%). Currently silver is down about 51 cents to $14.94. The bullion banks have been having a lot of trouble getting silver to cooperate with their manipulative efforts. On many days when gold is being hit, silver will trade higher on the day. I suggested at the beginning of the year that buying silver now would prove to be the trade of the decade. I maintain that call and silver currently is up over 8% YTD. I would suggest that all sell-offs in silver should be bought. 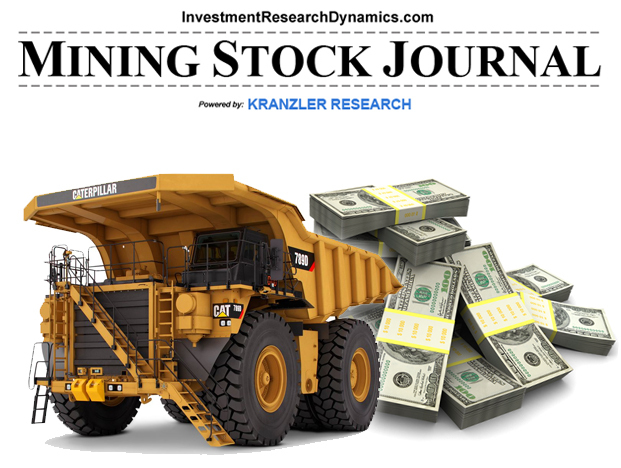 You can leverage your trade in silver with mining stocks. 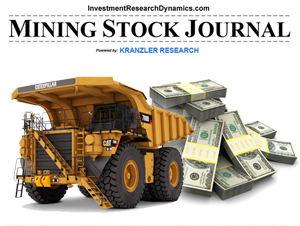 The latest issue of the Mining Stock Journal is now out and my current idea is what I believe to the best idea I’ve come across in 15 years (it’s gold exploration junior). You can subscribe to the MSJ by clicking on this LINK or on the graphic to the left. 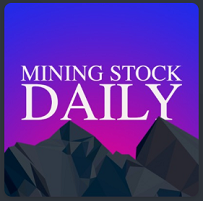 You subscription will include the latest issue, the first two issues published – the March 4th debut issue features an emerging silver producing company and includes call option recommendations – plus a glossary of mining industry terms to help you better understand the research presented. Using the “jobless claims” metric, the financial media and snake oil salesmen would have us believe that the Government-compiled jobs market metrics indicate “sustained strength in the labor market that should further dispel fears of a recession” – Reuters’ Animal Farm. The first time I read “1984,” I tried to imagine Orwell’s vision superimposed on the United States. Now I don’t have to imagine. Instead of Big Brother spying on us through our televisions (and they might through “smart” tvs), the Government monitors us through our cell phones, emails and web-browsing. It’s truly frightening and it’s quite stunning how so few in this country understand – or are willing to accept – the degree to which it occurs on a daily basis. While the Ministry of Propaganda spins its wheels convincing the public of a new bull market in stocks and a robust economic recovery are both in process – bolstered by a job market with more alleged openings than bodies willing to fill those alleged openings – the underlying structure of the economic and financial system is quickly rotting away. Zerohedge reports today that the yield spread between 2-yr and 30-yr Treasuries is at its lowest (the difference between the yield on the 2yr Treasury and the 30yr Treasury) since its low-point in 2008 – A Flat Yield Curve Spells Recession. There’s yet another comparison between 2008 and now. The fundamental problems which caused the 2008 de facto financial collapse were never fixed. Instead, they were “treated” with money printing and the massive expansion of credit. While this enabled the operators benefiting from these subtle and insidious this wealth transfer mechanisms, it also seeded the next big systemic earthquake, which has the potential to be 10x worse than 2008. Notwithstanding the Fed’s omnipresent intervention in the interest rate markets (Treasuries, repos, Fed funds and interest rate swap derivatives), the Fed has been unable to prevent a “flattening” of the yield curve. A flat yield curve is the Treasury market’s signal that the U.S. is going into a recession. Without that Fed intervention the Treasury would be inverted, a market event that verifies a deep recession in process. While treating the problems with negative interest rates, money printing, debt creation and the continuous effort to systematically control the markets may temporarily cover up the symptoms of the underlying problems, it is analogous to rubbing Neosporin on melanoma. Eventually that cancerous mole will manifest as untreatable lymphoma. The U.S. economic and political system is on the verge of a systemic disruption that will make life difficult for the entire population. It’s anyone’s guess when the catalyst hits that pushes that button, but the force with which the next 2008 times 10 hits will likely even shock and awe those of us who can see that something ugly is about to hit. The Government’s non-farm payroll report announced the creation of 242,000 news jobs in February. When the numbers hit the newswires, the Fed trading algos triggered a 12 point spike up in the S&P 500 futures and a $14 cliff dive in Comex gold futures. The Government’s propagandized economic reporting has deteriorated into nothing more than an epic insult to anyone with two brain cells to rub together. Beyond that, the reports are nothing more than a source of embarrassment for the “experts” who gather on the financial networks to dissect and analyze the numbers for the purpose of “baptizing” the report. Gold and silver this week have traded in complete defiance of Wall Street’s “siren call” for a big price correction. The Goldman Sachs analyst, Jeff Currie, incessantly insists on embarrassing himself with a forecast of $800 for Wall Street’s Pet Rock. Contacts at Goldman told me he was instructed under no uncertain terms wipe some of the rotten egg off his face and get on CNBC to raise his target to $1000. The behavior of gold this past week reflects an increasing loss of credibility in not just Government economic reports, but also a deteriorating faith in the fiat nature of the U.S. dollar. How can anyone place any faith in a Government which is comprised of nothing but thieves have any “credit” to back its currency? As it stands now, the U.S. dollar is backed by a technically bankrupt Government run by corrupt politicians who serve as well-paid human puppets for the banking and corporate interests who control them. On an interesting note, it was reported today that is suspending issuance of new shares in its physical gold ETF (ticker: IAU) due to a shortage of registered shares: LINK. This is highly misleading because market makers can borrow shares and short them to buyers. Currently there’s only 2.4 million shares short in IAU out of 635 million shares issued. That’s only .3% of the float, which means there’s 10’s of millions of shares available to borrow and short in order to satiate buyer demand. Compare this to GLD, which has 4.5% of the float shorted right now. The real reason Blackrock had to suspend issuance of shares is because it is seeing something in the physical market that is stopping the firm from creating new share “baskets” which require the procurement of physical gold to back those “baskets.” The best bet is that Blackrock knows it will ultimately be unable to buy enough physical gold on a timely basis to back the registration of new shares if called upon to do so. In other words, there is a short of Pet Rocks. Gold and silver are moving higher because all signs indicate that the markets are broken and the Government is beginning to lose control over the system. The flow of capital out of paper assets and in to physical gold and silver is further evidence that the Government, Wall Street and the financial markets are both quickly losing credibility. John, I woke up late this a.m., about 8:40 EST – that’s how much I care about the employment report. I turned on the tv to check the markets and saw the 292k and literally laughed out loud. It’s beyond shameless – it’s a full frontal assault on our intelligence. The Govt claims 45k new jobs in construction? But we find out earlier in the week that the Govt admits to rigging the construction spending number for the last 10 years. Is this some kind of joke? The NFP is a completely fictitious number and it truly confounds me every month to see how much time, energy and money is spent by the financial mafia discussing a number that is indisputably 100% fabrication. I don’t want to tossed into the cesspool of analysts who get sucked in to dissecting and discussing an economic report that is entirely fictitious. Let’s face it, it’s a made up number. The number reported is not even remotely credible when put in the context of what’s happening to the U.S. economy. I have better things to do with my time, like discuss this weekend’s NFL playoff games. I can assure you, Embry’s knowledge and analysis of NFL football is at least on par with his high level of insight – and the ability to communicate that insight – on the financial markets. To me the more interesting and relevant conversation encompasses how much longer can the insiders keep the financial markets propped up and how much longer will it be before the Government imposes complete totalitarian control over our system. 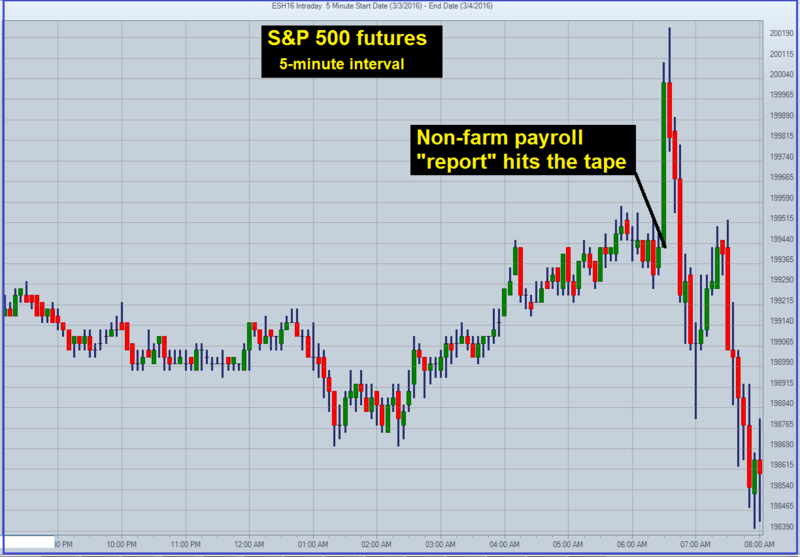 The response to today’s payroll by the stock and precious metals markets tells us that the market does not believe the NFP report. When the headline hit, the S&P 500 futures spiked up 14 pts to go up 30 pts from where they were at yesterday’s 4 p.m. NYSE close. Gold was smashed $8. Currently, three hours later, the S&P 500 cash market is down 8 from yesterday’s close and gold has snapped back $13 from post NFP low print. I will point out that the homebuilder stocks have dropped over 11% this year to date. 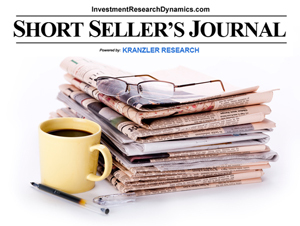 By the financial media’s yardstick, they are halfway to being considered in a “bear market.” If the NFP number had any fathomable degree of credibility, the homebuilder stocks would have staged a big rally today. They are down 2.2% today alone. Nothing more needs to be said on this matter. Please have a good weekend – enjoy what you can, as much as you can, while you still can. The rug is being pulled out from under us and the landing will not be pleasant.